Infantry troops of Company K, 3rd Battalion, 158th Regimental Combat Team, move along the road near Batangas Bay, Luzon, P.I. Taken 12 March 1945. On 9 January 1945, the United States 6th Army landed its forces on the beaches of Lingayen in Pangasinan to commence the liberation of Luzon from Japanese occupation. From there, the forces would mop up northern Luzon of Japanese positions and race south to liberate the capital city of Manila. At the end of the same month, the United States 8th Army landed on the beaches at Nasugbu in Batangas with the mission of blocking Japanese troops escaping south and, if viable, supporting the American offensive from the north. The task, which of course included the liberation of the Province of Batangas, was given to the 11th Airborne Division, which had landed in Nasugbu late the previous month. To accomplish the mission, however, a storied army group called the 158th Regimental Combat Team (RCT), nicknamed the “Bushmasters2” after a deadly viper the group encountered in jungle warfare training in Panama early in the 20th century, was attached to the division. The 158th was under the command of General Hanford McNider, who had earlier been wounded in the campaign in New Guinea and given command of the RCT on his recovery. He was considered something of a legend in the 158th and would be promoted to the rank of Lieutenant General by an act of Congress in 1956, five years after his retirement3. 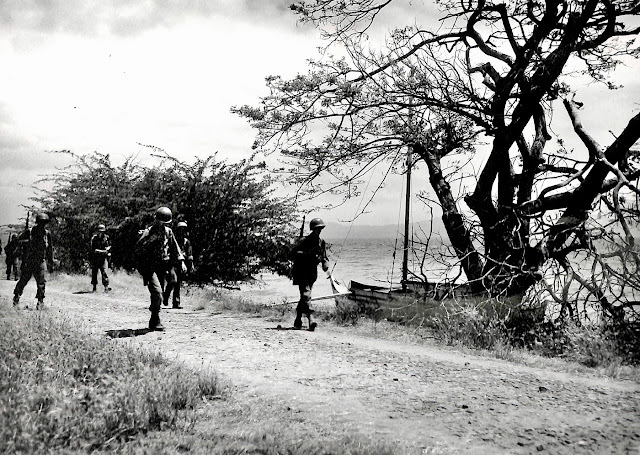 When the mission of liberating Southern Luzon, including Batangas, was started, the 158th moved out from Nasugbu on 4 March along the western side of Taal Lake. Fighting along this route was expected to be light in comparison to the eastern side of the lake, but this was just as well because the RCT was also being eyed for the liberation of the Bicol Peninsula. This was early in March, at which time the Division Headquarters of the 11th Airborne had been set up on Tagaytay Ridge. To speed up communication with the 158th, the US Army Corps of Engineers built a “dusty, twisting, narrow” road from Batulao to Lemery. Within the army, the road was referred to as the “Shorty Road.” This is likely the same road that in the present day is called the Diokno Highway. From Lemery, the RCT moved on to the Calumpang Peninsula – which separates the bays of Batangas and Balayan – to liberate the towns of Mabini and Bauan. Securing the peninsula was strategically important because it would keep the northern Verde Island passage safe for American ships supporting the Luzon campaign and allow for the development of bases along the shores of the two bays. Fighting near Mt. 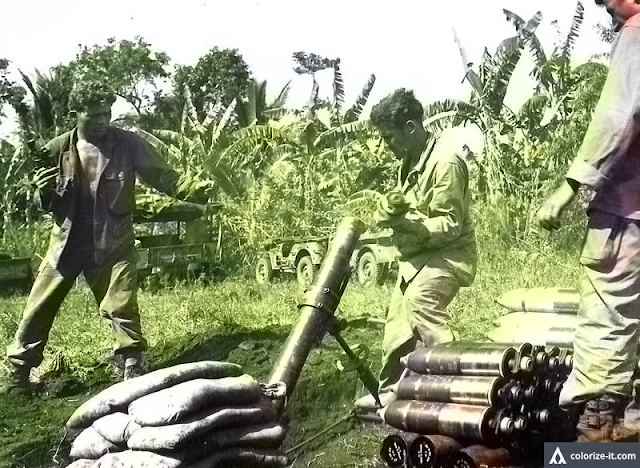 Maculot in Batangas, 1945. Image source: United States National Archives. Bauan was liberated on 9 March. By the 12th, the 158th had also secured the then-town of Batangas5. The RCT would be relieved from their posts at the Calumpang Peninsula and ordered to move into and attack Cuenca and Mount Maculot as well as its two “satellite” hills which the Americans called San Jose and Santa Rosa Hills. By the 23rd of March, the 158th had taken the town of Cuenca, but instead of pursuing well-dug in Japanese soldiers on Mount Maculot, the RCT was ordered to withdraw back to Lemery to start preparing for the planned assault on the Bicol Peninsula. The group’s position at the foot of Maculot was taken over by the 187th Infantry, diverted from Tanauan and given the task of completing the reduction of Japanese troops on Maculot. 1 Along with other information in this article, taken from “The Angels: A History of the 11th Airborne Division 1943-1946,” by Major Edward M. Flanagan Jr., published 1948 in Washington. 2 “158th Infantry Regiment (United States),” Wikipedia. 4 Along with other details in this article, from “United States Army in World War II: The War in the Pacific, Triumph in the Philippines,” by Robert Ross Smith, published 1963 by the Office of the Chief of Military History, Dept. of the Army. 5 “List of Towns Liberated by the US Army from 17 October 1944 to 11 August 1945,” created 1945 by the Office of the AC/S for Intelligence, G2, United States Army Philippines-Ryukyus Command.